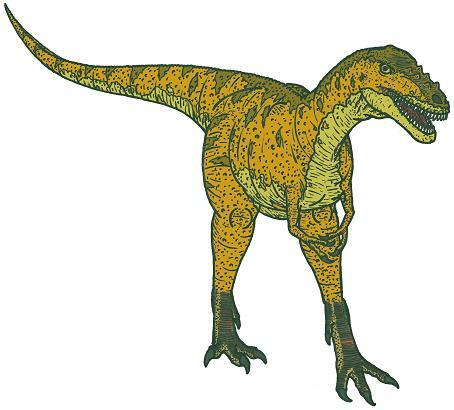 Alioramus was a carnivorous (meat-eating) dinosaur that lived in Mongolia Cretaceous period. Only a few fossils have so far been found, and they date to around 70 million years ago. Alioramus was probably about 20 feet (6 meters) long, and weighed about 2 tons. However, there is some speculation that the very few fossils so far found are from juvenile animals, and that adults may have been considerably larger. Asian Dinosaurs - Alioramus lived in Mongolia. Alioramus was a genus of dinosaur. Alioramus was a member of the Saurischia ("lizard-hipped") order of dinosaurs. What this means, is that although Alioramus was not closely related to lizards, it did have similarly shaped pelvic bones. Alioramus was a Theropod - a member of a group of related bipedal dinosaurs that included the ancestors of birds (although Alioramus was not itself an ancestor of birds). Alioramus lived about 70 million years ago, during the late Cretaceous period. Alioramus was a carnivore (meat-eater). Alioramus was perhaps about 20 feet (6 meters) long. It is not clear if the fossils so far found are from an adult or juvenile - so it is possible that adults were considerably larger than this. Alioramus probably weighed around 2 tons, but again it is possible that this might be the juvenile weight, and adults may have been larger and heavier.